B. Thomas (Arlington, Texas, United States) on 5 December 2018 in People & Portrait. 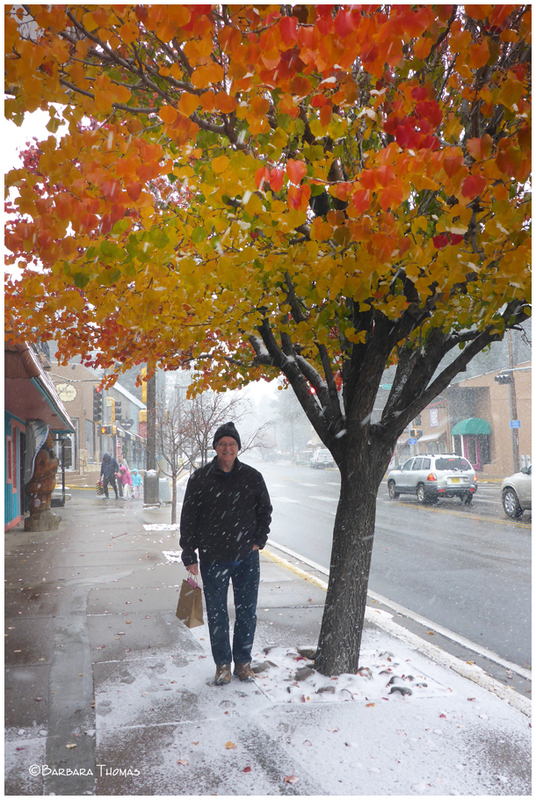 Hubby/Sherpa/Guide goes shopping with me on a cold, snowy day in Ruidoso, New Mexico. Nice portrait with a beautiful smile. Hubby is happy! Great contrast between the colorful tree and the snowy scene. Well done! Une très belle photo de rue! j'aime beaucoup ! Oeps.....the winter is coming with also leaves on the tree ! Colorful snow on the leaves ! Nice combination of autumn and winter ! And carries your loot, too. Great companion. the colorful tree adds a beautiful warm touch to the winter picture! I did not know it snowed in New Mexico! Beautiful contrast of snow and autumn leaves. @Ruthiebear: There are mountains, several first class ski resorts including Santa Fe and Taos, and it also snows in the desert in the winter. Lovely image of the tree..nice portrait too! Couleurs de l'automne et la neige. Magnifique contraste. A nice clear contrast, the white snow and the colorful autumn colors. I love the colours of the leaves popping out of the snow scene. @Steve Rice: It was actually fun since we seldom get to be out in snow.